Investors – Tibbar Plasma Technologies, Inc.
Do you have a need for a fusion device? We are currently seeking input from investors and interested parties about our plasma heat engine device. Our intent is to develop a small, simple and inexpensive aneutronic fusion energy system. We anticipate many potential uses and applications for this technology. If your company has a need for such a device, please take our survey! One avenue we are exploring is the use of our device in a small, compact system which may be suitable for space propulsion, particularly manned space flight. 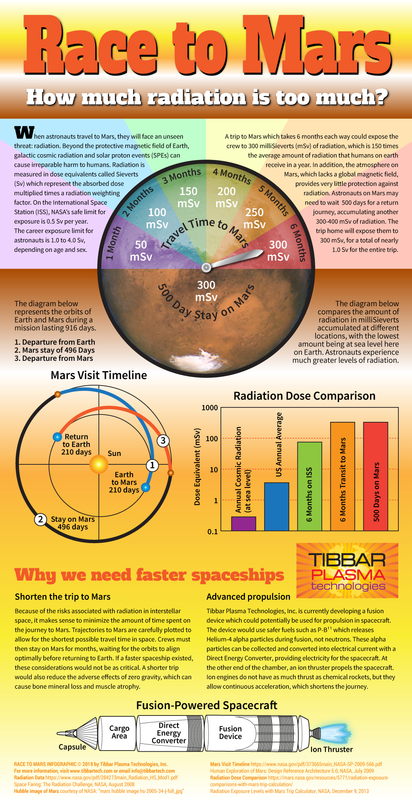 The infographic below highlights the need for such a system for interplanetary exploration.